Many residents who came to City Hall Tuesday, Aug. 7, spoke against a charter amendment that would allow councilmembers to run for a third term. Photo by Thomas R. Cordova. It’s official. 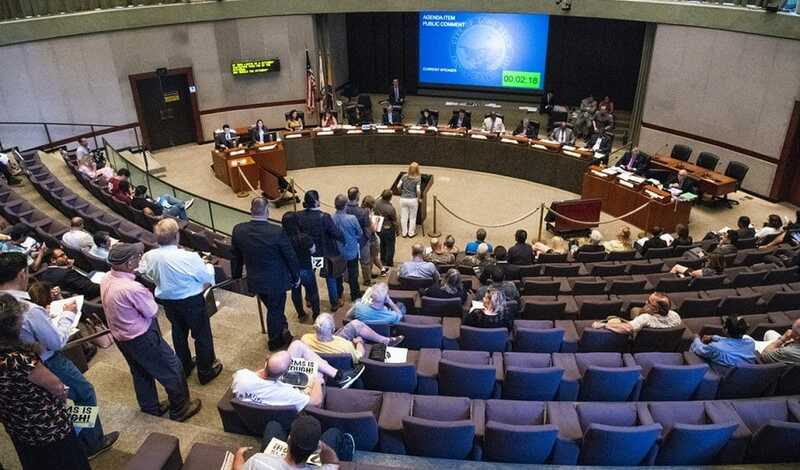 Long Beach voters this fall will consider four amendments to the city charter that could bring significant change, ranging from term limits for council members to redesigning the city’s nine council districts. After more than an hour of public comments, the City Council on Tuesday voted unanimously to add the four proposed charter amendments to the November ballot. The council decided to hold off on a fifth proposed amendment that would have consolidated the gas and water departments, after the water department asked for more time to study the impact. Citizens line up to speak at City Hall during the public comment during a discussion of proposed charter amendments, which the City Council placed on the November ballot. Long Beach August 7, 2018. Photo by Thomas R. Cordova. The mayor and council members currently are limited to two, four-year terms. But after their time is up, they could potentially run as a write-in candidate as many times as they wish. The amendment would expand term limits to three, four-year terms but would eliminate the write-in option. City officials have said the measure closes a loophole that allows a candidate to run indefinitely. But opponents on Tuesday called the measure “self-serving” for council members who could seek a third term. Only three politicians have won as write-in candidates in the city’s history. Former mayor Beverly O’Neill won a third term as a write-in in 1994, while council members Dee Andrews and Patrick Donnell, now an assemblyman, both won third terms. Others, like former councilmembers Jackie Kell, Tonia Reyes Uranga and Val Lerch, weren’t successful. If passed, the amendment wouldn’t apply to councilmembers such as Sixth District Councilman Dee Andrews, who won as write-in candidate prior to November 2018. If he opts to run again, Andrews could be in office a total of 16 years. Voters approved setting two, four-year terms in 1992. Critics, like resident Karey Sharp, questioned why the city needs to vote on the issue again. Suzie Price and Daryl Supernaw were the only two council members to express some concern about the term limit amendment, but both said they look forward to discussing the issue with their constituents. “At the end of the day we have to leave it up to the voters,” Supernaw said. Some questioned why the council would want to spend more than half a million dollars for a special election on charter amendments that didn’t seem necessary. The city will spend $470,000 for the first proposed amendment, with a cost of $45,000 for each additional amendment. Garcia said the city has already budgeted for the costs. Voters will also consider establishing an independent citizen commission that would redraw the boundaries for Long Beach’s nine council districts every 10 years at the release of the U.S. census. City officials said the move would lead to better representation for diverse communities. Several Cambodian-American residents turned out on Tuesday to support the measure with the hope that the city’s large Cambodian community will have better representation. Ninth District Councilman Rex Richardson said the city did a disservice to its Cambodians when it sliced its main neighborhood into four districts. “We need to fix our process that has wronged them in the past,” he said. In another measure, voters will consider changing language in the charter that allows the city auditor to conduct performance audits of all departments, boards, commissions and offices. City officials have said the current charter language is vague and that the measure would provide more clarity as to what the auditor oversees. Voters will also consider establishing an ethics commission to review areas such as campaign financing, lobbying and conflicts of interest. While council members lauded the effort as a way to boost public trust, some critics expressed concern that the commissioners would be selected by the mayor and approved by the council. Julie Haase said the city should find a better process for appointing members of the ethics commission. “If they’re only going to be appointed by one person, that just seems unethical on its face,” she said.